The head of Daimler Trucks has questioned, but not completely written off, the business case for heavy-duty truck platooning in light of other emerging technologies and fuel gains from new combination vehicles operating independently. Tests using combinations of the latest aerodynamic tractors and trailers showed the gains in miles per gallon were “not as high as expected,” said Martin Daum, head of Daimler AG’s trucks and buses divisions. He delivered his comments during the recent IAA Commercial Vehicles show in Hanover, Germany. “When it comes to automated vehicle technology, there is a very compelling business case for these systems,” Daum said. “However, platooning might not be the holy grail we initially thought. Therefore, I am a little bit critical of platooning today. The earliest tests of two closely spaced Class 8 trucks and trailers in a platoon — whose braking and acceleration are linked through software and wireless communications, while steering remains manual — showed gains in fuel efficiencies of about 4% for the lead vehicle and about 10% for the trailing truck. Meanwhile, in the United States, one group of researchers is looking into an autonomously controlled platoon. The American Center for Mobility at Willow Run announced organizations representing defense, academia and the public sector will research and test automated convoy platooning during a two-year study that will feature military and commercial trucks in a closed environment and on public roads. The study will analyze controlling vehicles’ throttle, brake and steering autonomously while maximizing fuel efficiency and safety, according to the Ypsilanti Township, Mich.-based nonprofit, which is one of 10 U.S. Department of Transportation-designated automated vehicle proving grounds. 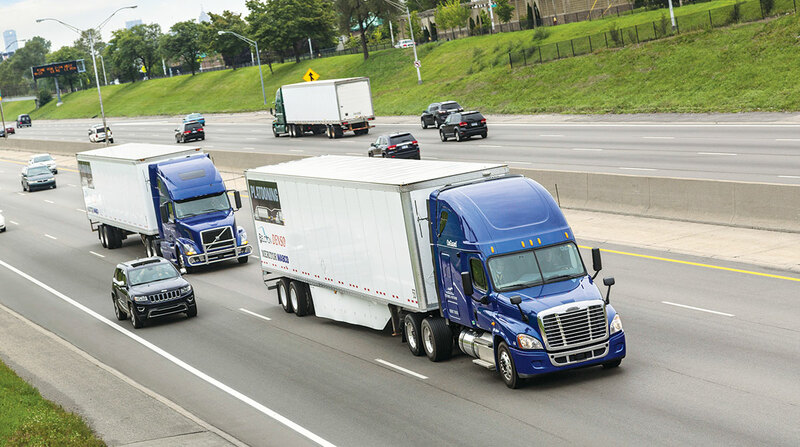 “Truck platooning will pay safety and environmental benefits that we can only begin to imagine,” Kirk Steudle, director of the Michigan Department of Transportation, said in a statement. Steudle also is ACM’s interim CEO. At the same time, a European consortium called Ensemble is getting underway to demonstrate multibrand truck platooning on public roads in 2021. DAF, Daimler Trucks, Iveco, Man and Scania, and Volvo Trucks and Renault Trucks, are involved in the project, according to Ertico, the European intelligent transportation systems public-private partnership. Significant advances in platooning technology have been made in the past decade; however, a multibrand approach is now required, according to Brussels-based Ertico. The main benefits from platooning are the cost savings in fuel and some relatively easy miles for the driver in the trailing truck, said Eric Grice, project manager of transportation solutions consulting for enVista, a supply chain consulting and IT services firm, based in Carmel, Ind. For a shipper with a private fleet or dedicated contract carrier covering long distances, platooning makes sense, he said. “There will definitely be a perceived operational cost from planning and coordination of drivers and routes to get them traveling together at the same time within service hours and having the same breaks, etc.,” he said. “As far as shippers choosing from the common carrier pool, in the end it comes down to pricing in most cases. If carriers are able to effectively use platooning to reduce their overall costs and pass those along to shippers, then they will have a competitive advantage and be able to acquire additional business,” Grice said. In the meantime, if it makes sense to platoon two trucks over a long distance, it also might make sense to run double or triple trailers pulled by a single truck over a long distance — an option blocked in many areas by regulations, another consultant said. “You can find an argument in there for something that is less technologically challenging,” said Rick Mihelic, president of Mihelic Vehicle Consulting in Lewisville, Texas. “But there is more of an investing sexiness to platooning, which is on the verge of becoming a reality. There are prototypes out already, but production use of it is still a little ways off. But Mihelic said data he collected when involved in tests that platooned the ultra-sleek Super Trucks developed in a U.S. Department of Energy program showed double-digit gains in fuel efficiency were possible. Other companies involved in commercializing platooning did not respond to a request for comment.